This slot, brought to you by NovomaticCasino.co.uk, is an absolute delight to behold and, more importantly, to play! The beautifully designed fruit symbols are so detailed, you’ll struggle to believe you’re not looking at a photograph or even the real thing! What’s more, the realistic fruit is worth an absolute fortune – the proof is in the pudding, or, in this case, the hefty jackpot! Packed full of fruity features and free games, Fruit Fall is an online slot bound to be loved by players the world around. Give it a go and see for yourself! All of the symbols in Fruit Fortune are based on those slot symbols you’ve all come to know and love. The realistic fruit symbols include: cherries, oranges, lemons, plums, grapes and watermelon; there are also red, green and blue bar symbols; the red seven; a Scatter and a Wild. The Wild symbol is the jolly jester, and he substitutes for all symbols except the Wild symbol, which is a dazzling diamond! Fruit Fortune is an excellent game for those who are relatively new to the world of online slots, as well as those experts who want to get back to basics with something retro and epically fun! Your balance is displayed, at all times, at the bottom left of the screen and your winnings on the right. Your bet is clearly shown in the middle of your screen, at the bottom. The minimum bet is 0.01 and you can easily increase or decrease your bet, at any time, using the plus and minus symbols, as well as altering the number of lines which you wish to bet on. Like most NovomaticCasino.co.uk games, you can play for free until you’re ready to play with and win real money! Once you’re comfortable with your skills and your bet, you can click ‘autoplay’ and let the game play on your behalf. Winning without effort is the best kind of winning! Another great feature in Fruit Fortune is its gamble feature. Sometimes, it can get a bit dull when you’re choosing between red and black so, luckily, the developers of this game thought of something different. Each time you get a payout, you can either choose to collect or gamble it. If you choose to gamble, you could double, quadruple or octuple your win! There are several steps in the gamble ‘pyramid’ which flash on and off. If you click at the right time, i.e. when the light is flashing on, then you’ll double your win and move on to the next step! Have you got what it takes to make it to the top? Find out for yourself with Fruit Fortune! In this game, the jester is most definitely your happiest and luckiest best friend! Fruit Fortune has a progressive jackpot, which means it keeps getting bigger and bigger the more you play – in fact you can even see the amount rising with each spin! – and the way to win this jackpot in Fruit Fortune is to fill all of the reels with the jolly jester Wild symbol! Not only that but the jester also substitutes for all symbols, except the Scatter, so he’s often turning up to save the day! What’s more, spin three or more Scatter symbols, the dazzling diamond, and the free games bonus round will be triggered! During these free games, a jillion more jolly jesters will be added to the reels and you’ll notice the wins just keep on coming. A fortune indeed! 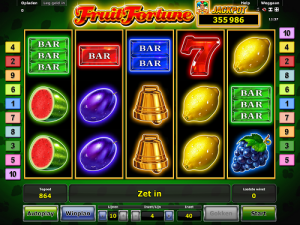 Fans of Fruit Fortune are sure to love our other slots, especially Golden Sevens and Fruits n Sevens. Not only that but our table games and live casino games will appeal to Fruit Fortune aficionados too!